Wayne Morris: Good morning and welcome to the International Connection once again. This is a continuation of a radio series on mind control that we are bringing you here. We heard, for the last five weeks, a lecture and interview by Dr. Colin Ross, detailing the history of CIA mind control experimental programs that have been documented in material obtained under the Freedom of Information Act. What we are going to hear today is the mind control testimony that was introduced into the Presidential Advisory Committee on Human Radiation Experiments on March 15, 1995. President Clinton has apologized and compensated some of the victims of the radiation experiments. At the end of the hearing however, Valerie Wolf, Claudia Mullen and Christine deNicola gave their testimony about mind control experiments and linked in with the radiation experiments. We are going to hear the testimony that was given to the Advisory Committee in the second half of the show. In the first half, we are going to hear Claudia Mullen talk about the experience of giving testimony at the Presidential hearings. Claudia is a survivor of CIA mind control experimentation for many years, and got introduced to this through Tulane University, and we heard Colin Ross talk about Tulane's involvement in the mind control programs in previous weeks' broadcasts here. It is extremely brave of these women to come forward, and they really, in effect, broke the silence for many survivors. You are listening to 88.l, CKLN. But when she leaves the room, her life is never the same again because she has been asked to give testimony in front of a Presidential Committee on Radiation, and... that's pretty much what I wanted to tell you all... was what the experience was like and I have some clips from the testimony to show you and then... you all got hand-outs, but they are not complete, but anyhow. She walks in the room and there are obviously a lot of important people there but there are also a lot of just everyday people... people of all ages. The only people that are missing are children. There aren't any children there, but it's a good thing, because it's scary, what she hears from the people who get up ahead of her to tell their stories. It is pretty heart-wrenching and she forgets to be nervous for a while because they just move her so much. But then finally she hears her name, she realizes "oh, I have to give testimony", so she goes up and she gives her testimony and they ask her questions, and then when she leaves the room... all of a sudden everybody knows her name now, and people just start storming all over her and telling her how brave she is and she feels scared to death and she can't figure out why everybody thinks she is so brave... but she got up and told her story about the Monster Mom, and about the Magister, and about the camp, and about the cabins, the Deep Creek Lodge place, and I forgot to tell you how she remembered. Because remember how I said that she always ... I always forgot everything. As soon as I got home, I would forget what had happened and that went on, when I went away to college, I still had no memory of it. And then in October of 1992 something happened to me, completely unrelated, it had nothing to do with any of this ... just another crime in a series of a lot of crimes actually... a man comes into her home, a man that she knows, and he assaults her, he rapes her, and he beats her for hours and she thinks it is the worse thing that has ever happened to her, but somehow it is really familiar to her. After that day, all of a sudden she starts getting all of these horrible nightmares and memories and flashbacks. She didn't even know what a flashback was then. Flashbacks start coming and it pretty much triggered all the memories that started coming back. And so from the time she goes to Washington, she's only about half way through doing the memories so it is really kind of hard when she gets up to talk about it because she has to control, not to go into a flashback when she is talking about it. But it turns out okay and after that, I have to say why she is never the same again. From then on there was no going back. Once I did it, I had to keep talking because if you stop talking, that's when they get you. There are a lot of, to be honest there are a lot of good things and there are some bad parts about testifying. The good part is that she got to tell her story and people believed her. She was asked to tell her story and because ... when the memories started coming back she went into treatment and into therapy... her imaginary friends woke up, after all these years, they woke up again, and they came out and they would start writing furiously... I mean pages... until it became into a book... about this big. All of the memories, all of the people, all the places that she went, what the people's titles were, who they worked for, how much money they got, anything that they talked about... whole conversations. And she sent off the information to various experts across the country who tried to verify as much as they could, and lo and behold, there was a lot of stuff in there that wasn't written down anywhere that hadn't been released yet, but they think it is in the CIA files but...It's good that she got up to tell her story, and every time she tells her story it's a little more healing, it's therapeutic. It also gives other people a chance to tell their stories, because it kind of starts something going... because ever since that day people have started to talk about what happened, and she has met so many other children that are now grown-up and they are starting to remember and she knows she is not alone anymore. Because all those years, even though she did remember a lot, she was really alone, and she thought "special" meant alone or "odd" and I guess you could say the bad part, like I said once you testify, it becomes public record and the good part is you can't be sued because as long as you are telling the truth... and that's what I did... you are making accusations against people but they can't sue you because you are testifying, and it's the truth, and you can talk about the same people as much as you want and they can't ever sue you. That's one thing I didn't have to worry about, being sued. I have been threatened and harassed, assaulted since it happened and I wouldn't be telling the truth if I said everything was just great since then because there have been some bad times, but would I do it all over again knowing what would happen? I wouldn't change a thing, I would still do it in a second. I would do it after I had all my memories back... that's the only thing I would change. Another reason that it would have been better if I had recalled all my memories before I testified was that I realized they used a lot of time distortion along with the drugs and the electricity and the trauma, they used hypnosis and they could distort time and it somehow gets to confuse people... they thought if there is a slight chance that she is going to remember, at least she will get things all confused. Plus they throw in a few things like ceremonies and things like that just so you will sound really crazy if you ever start to remember. And so my testimony would have been a little more accurate... there's a few distortions in there, a few... like mixing people's names with the wrong face... but once I got all my memories then I remembered exactly, but you can't change the testimony. Once it is given, it is given. I thought maybe you all would like to see a little clip from it. I didn't bring my testimony because, as you can probably imagine, I don't like seeing myself on film. I don't mind having my picture taken, but I really can't stand watching myself on film and I guess you know why. I mainly wanted to give you an idea of what it looks like and... because hopefully, in the near future, there will be a Commission for Victims of Mind Control. This focused on radiation, and we were allowed to testify because... and there were four of us who were victims of mind control ... but they used radiation. I was, I guess one of the lucky ones, because they didn't use a lot of radiation with me. They took a lot of x-rays because I got hurt a lot, but with some mind control victims, they used a lot of radiation and that's how we got to testify in front of a Radiation Commission. But hopefully, that's what we are trying to do ... that 's what the whole movement is about. What we got started is we are trying to get a Committee to investigate CIA files that have to do with mind control. So I will show you a little bit of what it was like, and the kinds of questions they ask you because that's what you have to be prepared for. They only gave us two and a half weeks to prepare... I went with my therapist and one other girl from New Orleans and then another person came from New Mexico to testify, and then there were six other people, but they were testifying strictly about radiation. We were able to submit as much material as we wanted ahead of time but you could only talk for five minutes... but they gave us a bit longer. We were told you had to put everything down and say it within five minutes... and then leave time for questions. Since they did ask you questions. The reasons I left the questions in is that was the tough part. The questions. I mean it's not that they were hard to answer, it just kind of put you on the spot, you know, and not knowing exactly what they were going to ask you. So this will give you a good idea of what kind of things they might ask, what it might be like. In the handouts, I just wanted to mention, the reason I didn't read, or tell you what was in my testimony, I put in a little bit about the Advisory Committee and that's the agenda for the day we were testifying, and a Memorandum from the Vice President about the research. Then my therapist, who talked before I did, showed how there was a link between mind control and radiation and how the memories had started to come back and all the therapists who she had been talking to all over the country... their clients were saying the same thing. Not exactly the same thing, but it was so similar it was uncanny. And this is my statement, but I actually submitted a lot more material than that ... names, places, dates, anything I could remember. This is in October ... we finally got the final report of the Advisory Committee. This is what ... it's two pages. Actually nobody even called us and told us they came out with any recommendations. I saw it on the internet. Somebody sent it to me by e-mail. You've got to remember that these Committees last about a year, they meet once a month, in different parts of the country so different members of the public can come talk. They reach every area of the country. So this had been going on... we were at the very end of it. It had been going on since March or April of 1994. So this is what the recommendations were... they listened to us, like I said, because they recommended that all records of the CIA bearing on programs of secret human research such as MKULTRA... that's all the names of the projects that I could remember... they recommended that they be declassified. Of course that hasn't happened yet. There are some steps here to advocate for investigating, informing, advocacy groups like Lynne and Blanche's group that they started ACHES-MC ... they can correct me if I am wrong but this is kind of because we put our foot in the door and testified ... they started ACHES-MC (Advocacy Committee for Human Experimentat Survivors - Mind Control). And also if you would like to read the testimony itself... there is a book by Jon Rapaport called "US Government Mind Control Experiments on Children: They Want to Know". In the back of the room there are some fliers on how you can order that. The documentation ... they kept asking us about "where is documentation?" For one thing, my memories are considered documentation. All the people I remembered, places, project names, numbers, medical records, psychiatric records, my therapist's records. School records... we actually went back and verified that I did miss school at these times that I remembered. In grade school I probably missed a third of every year and yet I was never held back, I don't know why. Family records are considered documentation ... you can go back and talk to relatives who remember you were gone at this period of time. Also remember seeing your burns, or being treated at Tulane ... my sister remembers that. Pictures from childhood. My mother kept scrapbooks. She usually had two scrapbooks a year and then except for two Christmases, there are no Christmas pictures with me in it. There is my sister, my mother, my father, and I am not in any of them, because I wasn't there. And there are pictures of my sister's birthdays, but none for me. Notes, cards, or anything from the perpetrators. I actually did ... I got a Christmas card from Uncle Otto. Remember Uncle Otto from....??? I don't know if he really wrote it or not. They might have just done it to make me feel like ... I don't know. Anyhow I got a Christmas card from him and the Magister gave it to me and said Uncle Otto had sent it. He also gave me a doll. He sent me a doll as a Christmas present. They took it away from me. Any material, harassment material, I got quite a bit of this... and I will probably will when I go home... I get it in the mail. I get it at the house and I have the police come every time... it's written on my house, on my car, fence. It's been written mostly in red paint... sometimes animal blood or gore. They are like threats, or you know... it's just harassment. Things like "Die", "Shut Up", or whatever. And so every time that happens I have to have the police come out and take pictures so it is documented. I keep everything that I get in the mail. I have caller ID and call tracer ... and sometimes I will get phone calls and they will say words that are supposed to trigger me and remind me of things that happened. They will call me Chrystal, which was my name. Also, you can order your phone records. Every month, along with my bill, I get every phone call that came into my house ... it is written down, where it's from. Military records. How the memories match the projects and experiments. The similarity of stories between people. Also it is a good idea, but don't ever do this alone, to go back to the sites if they are still there. You would be surprised. A lot of the buildings are still there, Tulane University is still there... it's still going strong. Go back there and take pictures of places you were in... but you don't go alone. I went with my therapist because I was afraid of going into flashback. And of course, the CIA files, if you can get them declassified. And there might be information that you know that isn't written or validated anywhere, in any book. Everybody has to decide for themselves, if they want to start talking. But I think you can see how it is important and it helps the healing process. It puts you in touch with people that you never thought you would meet. You get to know people who went through the same thing you did... and that's validation for yourself. That's just as important... you have to decide if the good outweighs the bad. Like I said, I would do it again in a minute. Somebody once said, great spirits have always encountered violent opposition from mediocre minds ... Albert Einstein said that. I like that. Wayne Morris: We are next going to hear that testimony in Washington (March, 1995). First you will hear Valerie Wolf, Claudia Mullen's and Chris deNicola's therapist; then Chris deNicola, then Claudia Mullen. Hearing spokesperson: Forgive me if I am not pronouncing these names correctly ... we have Ms. Chris Denicola, Ms. Valerie Wolf, and Ms. Claudia Mullen. Are you all of New Orleans? Ms. Chris Denicola, Ms. Valerie Wolf, and Ms. Claudia Mullen: Yes. Hearing spokesperson: Thank you for making the effort to come up and speak to us. Valerie Wolf: I am going to start. My name is Valerie Wolf. In listening to the testimony today, it all sounds really familiar. I am here to talk about a possible link between radiation and mind control experimentation that began in the late 1940's. The main reason that mind control research is being mentioned is because people are alleging that they were exposed as children to mind control, radiation, and chemical experimentation which were administered by the same doctors who were known to be involved in conducting both radiation and mind control research. Written documentation has been provided revealing the names of people, and the names of research projects in statements from people across the country. It is also important to understand mind control techniques and follow-ups into adulthood may have been used to intimidate particular research subjects into not talking about their victimization in government research. As a therapist for the past twenty-two years, I have specialized in treating victims and perpetrators of trauma, and their families. 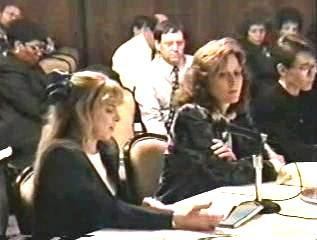 When word got out that I was appearing at this hearing, nearly forty therapists across the country (and I had about a week and a half to prepare) contacted me to talk about clients who had reported being subjected to radiation and mind control experiments. The consistency of people's stories about the purpose of the mind control and pain induction techniques, such as electric shock, use of hallucinogens, sensory deprivation, hypnosis, dislocation of limbs, and sexual abuse is remarkable. There is almost nothing published on this aspect of mind control abuse with children, and these clients come from all over the country having had no contact with each other. What was startling was that many of these therapists were reporting that clients were also physically ill, with auto-immune problems, thyroid problems, multiple sclerosis, and other muscle and connective tissue diseases as well as mysterious ailments for which a diagnosis cannot be found. Plus somatization disorder is commonly found in these clients. Many of the clients who have been involved in human experimentation with the government, have multiple medically-documented physical ailments and I was really shocked today to hear one of the speakers talk about the cysts and the teeth breaking off because I have a client that that is happening to. Many of the people are afraid to tell their doctors their histories as mind control subjects for fear of being considered to be crazy. These clients have named same of the same people; particularly Dr. Greene, who was associated with client reports of childhood induction of pain, childhood mind control techniques, and childhood sexual abuse. One of my clients who had seen him with a name tag, identified him as Dr. L. Wilson Greene. A person with this same name was the Scientific Director of the Chemical and Radiological Laboratories at the Army Chemical Centre, and that he was engaged in doing research for the army and other intelligence agencies. Other names that have come to light are Dr. Sidney Gottlieb, Dr. Martin Orne (who it is reported were also involved in radiation research). It needs to be made clear that people have remembered these names and events spontaneously, with free recall, and without the use of any extraordinary retrieval techniques such as hypnosis. As much as possible, we have tried to verify the memories with family members, records, and experts in the field. Many attempts have been made through Freedom of Information filings to gain access to the mind control research documentation. Requests have generally been slowed down, or denied; although some information has been obtained. Which suggests that at least some of the information supplied by these clients is true. It is important that we obtain all of the information contained in CIA and military files to verify or deny our clients' memories. Although many of the files for MKULTRA may have been destroyed, whatever is left, along with the files for other projects, such as BLUEBIRD and ARTICHOKE to name only two, contain valuable information. Furthermore, if, as the evidence suggests, some of these people were used in radiation experiments, there might be information in the mind control experiment files on radiation experiments. We need this information to help in the rehabilitation and treatment of many people who have severe psychological and medical problems which interfere with their social, emotional and financial well-being. Finally, I urge you to recommend an investigation into these matters. Although there was a Commission on Mind Control, it did not include experiments on children, because most of them were too young, or still involved in research in the late 1970's to come forward. The only way to end the harassment and suffering of these people is to make public what has happened to them in the mind control experiments. Please recommend that there be an investigation and that the files be opened on the mind control experiments as they related to children. Thank you. Chris deNicola: Good afternoon. I am Chris deNicola, born July 1952, rendering me thirty-two years of age. I was a subject in radiation, as well as mind control and drug experiments performed by a man I knew as Dr. Greene. My parents were divorced around 1966 and Donald Richard Ebner, my natural father, was involved with Dr. Greene in the experiments. I was a subject in 1966 to 1976. Dr. Greene performed radiation experiments on me in 1970 focusing on my neck, throat and chest. 1972 focusing on my chest, and focusing on my uterus in 1975. Each time I became dizzy, nauseous and threw up. All these experiments were performed on me in conjunction with mind control techniques and drugs in Tucson, Arizona. Dr. Greene was using me mostly as a mind control subject from 1966 to 1973. His objective was to gain control of my mind and train me to be a spy assassin. The first significant memory took place at Kansas City University in 1966. Don Ebner took me there by plane when my mom was out of town. I was in what looked like a laboratory and there seemed to be other children. I was strapped down, naked, spread-eagled on a table on my back. Dr. Greene had electrodes on my body, including my head. He used what looked like an overhead projector and repeatedly said he was burning different images into my brain while a red light flashed aimed at my forehead. In between each sequence, he used electroshock on my body and told me to go deeper and deeper, deeper. While repeating each image, would go deeper into my brain and I would do whatever he told me to do. I felt drugged because he had given me a shot before he started the procedure. When it was over, he gave me another shot. The next thing I remember I was with my grandparents again in Tucson, Arizona. I was four years old. You can see from this experiment that Dr. Greene used trauma, drugs, posthypnotic suggestion and more trauma in an effort to gain total control over my mind. He used me in radiation experiments both for the purposes of determining the effects of radiation on various parts of my body and to terrorize me as an additional trauma in the mind control experiments. The rest of the experiments took place in Tucson, Arizona out in the desert. I was taught how to pick locks, be secretive, use my photographic memory and a technique to withhold information by repeating numbers to myself. Dr. Greene moved on to wanting me to kill dolls that looked like real children. I stabbed a doll with a spear once after being severely traumatized, but the next time I refused. He used many pain induction techniques, but as I got older, I resisted more and more. He often tied me down in a cage which was near his office. Between 1972 and 1976 he and his assistants were sometimes careless and left the cage unlocked. Whenever physically possible I snuck into his office and found files and memos addressed to CIA and military personnel. Included in these files were projects, sub-projects and experiment names with some code numbers about radiation and mind control experiments which I have submitted in the written documentation. I was caught twice and Dr. Green ruthlessly used electroshock, drugs, spun me on a table, put shocks on my stomach and my back, dislocated my joints, and used hypnotic techniques to make me feel crazy and suicidal. Because of my rebellion and growing lack of cooperation, they gave up on me as a spy assassin. Consequently during the last two years, 1974-76, Dr. Greene used various mind control techniques to reverse the spy assassin messages, to self destruct and death messages. His purpose? He wanted me dead, and I struggled to stay alive all of my adult life. I believe it is by the grace of God that I am still alive. These horrible experiments have profoundly affected my life. I developed Multiple Personality Disorder because Dr. Greene's goal was to split my mind into as many parts as possible so he could control me totally. He failed, but I have to endure years of constant physical, mental and emotional pain even to this day. I have been in therapy consistently for twelve years, and it wasn't until I found my current therapist two and a half years ago, who had knowledge of the mind control experiments, that I have finally been able to make real progress and begin to heal. In closing, I ask that you keep in mind that the memories I describe are but a glimpse of the countless others that took place in the ten years in between 1966 and 1976. That they weren't just radiation, but mind control and drug experiments as well. I have included more detailed information of what I remember in your written documentation. Please help us by recommending an investigation and making the information available so that therapists and other mental health professionals can help more people like myself. I know I can get better. I am getting better. And I know others can too. With the proper help. Please help us in an effort to prevent these heinous acts from continuing in the future. Thank you very much. Claudia Mullen: Good afternoon. Between the years 1957 and 1984 I became a pawn in the government's game. Its ultimate goal was mind control and to create the perfect spy, all through the use of chemicals, radiation, drugs, hypnosis, electric shock, isolation in tubs of water, sleep deprivation, brainwashing, verbal, physical, emotional and sexual abuse. I was exploited unwittingly for nearly three decades of my life and the only explanations given to me were "that the end justifies the means" and "I was serving my country in their bold effort to fight communism". I can only summarize my circumstances by saying they took an already abused seven year old child and compounded my suffering beyond belief. The saddest part is, I know for a fact I was not alone. There were countless other children in my same situation and there was no one to help us until now. I have already submitted as much information as possible including conversations overheard at the agencies responsible. I am able to report all of this to you in such detail because of my photographic memory and the arrogance of the people involved. They were certain they would always control my mind. Although the process of recalling these atrocities is not an easy one, nor is it without some danger to myself and my family, I feel the risk is worth taking. Dr. L. Wilson Greene received $50 million dollars from the Edgewood Chemical and Radiology Laboratory as part of the TSD, or Technical Science Division of the CIA, once described to Dr. Charles Brown that "children were used as subjects because they were more fun to work with and cheaper too. They needed lower profile subjects than soldiers and government people so only young willing females would do. Besides," he said, "I like scaring them. They in the Agency think I am a God, creating subjects in experiments for whatever deviant purposes Sid and James could think up" (Sid being Dr. Sidney Gottlieb; James is Dr. James Hamilton). In 1958 they told me I was to be tested by some important doctors from the Society, or the Human Ecology Society and I was instructed to cooperate. I was told not to look at anyone's faces, and to try hard to ignore any names because this was a very secret project. I was told all these things to help me forget. Naturally, as most children do, I did the opposite and remembered as much as I could. A Dr. John Gittinger tested me, Dr. Cameron gave me the shock, and Dr. Greene the x-rays. Then I was told by Sid Gottliebe that "I was ripe for the big A" meaning ARTICHOKE. By the time I left to go home, just like every time from then on, I would remember only whatever explanations Dr. Robert G. Heath, of Tulane Medical University, gave me for the odd bruises, needle marks, burns on my head, fingers, and even the genital soreness. I had no reason to think otherwise. They had already begun to control my mind. The next year I was sent to a lodge in Maryland called Deep Creek Cabins to learn how to sexually please men. I was taught how to coerce them into talking about themselves. It was Richard Helms, who was Deputy Director of the CIA, Dr. Gottlieb, Capt. George White, Morris Allan who all planned on filling as many high government agency officials and heads of academic institutions and foundations as possible so that later when the funding for mind control and radiation started to dwindle, projects would continue. I was used to entrap many unwitting men including themselves, all with the use of a hidden camera. I was only nine years old when the sexual humiliation began. I overheard conversations about part of the Agency called ORD which I found out was Office of Research and Development. It was run by Dr. Greene, Dr. Steven Aldrich, Martin Orne and Morris Allan. Once a crude remark was made by Dr. Gottlieb about a certain possible leak in New Orelans involving a large group of retarded children who had been given massive doses of radiation. He asked why was Wilson so worried about a few retarded kids, after all they would be the least likely to spill the beans. Another time I heard Dr. Martin Orne, who was the director then of the Scientific Office and later head of the Institute for Experimental Research state that "in order to keep more funding coming from different sources for radiation and mind control projects", he suggested stepping up the amounts of stressors used and also the blackmail portions of the experiments. He said, "it needed to be done faster then to get rid of the subjects or they were asking for us to come back later and haunt them with our remembrances." There is much more I could tell you about government sponsored research including project names, sub project numbers, people involved, facilities used, tests, and other forms of pain induction, but I think I have given more than enough information to recommend further investigation of all the mind control projects, especially as they involved so much of the use of the radiation. I would love nothing more than to say that I dreamed this all up and need to just forget it. But that would be a tragic mistake. It would also be lie. All these atrocities did occur to me and to countless other children, and all under the guise of defending our country. It is because of the cumulative effects of exposure to radiation, chemicals, drugs, pain, subsequent mental and physical distress that I have been robbed of the ability to work and even to bear children of my own. It is blatantly obvious that none of this was needed, nor should ever have been allowed to take place at all, and the only means we have to seek out the awful truth and bring it to light is by opening whatever files remain on all the projects, and through another Presidential Commission on Mind Control. I believe that every citizen of this nation has the right to know what is fact, and what is fiction. It is our greatest protection against this ever happening again. In conclusion, I can offer you no more than what I have given you today -- the truth. And I thank you for your time. Committee Spokesperson: Thank you for your presentations. We appreciate that this is not an easy thing to do. Are there comments or questions? Dr. Duncan C. Thomas (Professor, University of Southern California, School of Medicine, Department of Preventive Medicine, Los Angeles, California):Can I ask either of you where were your parents through all this? Do you have any idea how you were recruited in the first place? Did you have parents? Did your parents know anything about what was going on? Chris DeNicola: I can make a brief statement on that. It was my father who was involved with Dr. Greene. My mother was not aware because they were divorced when I was four years old, before that ... separated. What would happen, how he gained access to me is that these experiments actually took place in the middle of the night, and he would sneak in while my Mom was asleep, take me out and she had absolutely no knowledge of what happened. However, when these memories did surface, and I began to tell her about them, there was no question in her mind that he was capable. He had been in the military, in the Air Force. He had access to meet Dr. Greene, so in answer to your question, it was my father. He groomed me from the very beginning, started sexually abusing me from the very beginning, and it was just something that he wanted to do and he was closely involved with Dr. Greene, but my Mom had no knowledge. The only thing she knew was that she wanted to get away from him. She didn't know why. She just knew she had to get away from him because of my reaction to him. I am sorry, I didn't mean to go on. Thank you. Claudia Mullen: Do you want an answer from me also? Dr. Thomas: That's up to you. Claudia Mullen: The way I got involved was I was adopted when I was two and a half years old by a woman who sexually abused me, and then she was a friend of the Chairman of the Board of Tulane University at the time. As a favour ... I began to exhibit symptoms of typical childhood abuse beginning very young and she asked him to recommend a child psychiatrist and it was Dr. Heath who was involved .... dissociate and that I had almost perfect recall and I passed all the personality tests that they gave me. Heath suggested me for the project. That's how I got into it. My father had no idea. He died when I was very young, but I don't know if my mother knew or not. I don't think she really cared to tell you the truth. Then she died when I was a teenager so ... after that they had access to me from then on. Lois L. Norris (Second Vice President of Omaha National Bank and Omaha National Corporation (Retired), Omaha, Nebraska): You mentioned that there are others across the country who are recalling similar things. Do they all cover the same time span, generally, or do you have a feel for that? Claudia Mullen: Later than that I found out. Because after my parents died, there was no one to protect me ... my particular monitor was a physician at Tulane University and so he was a family friend also and he just kept on making sure that I kept going back and forgetting. Claudia Mullen: They still monitor you though. I am in some danger coming here today because I am still being watched. Valerie Wolf: I know it sounds unbelievable but there is actual ... she gets stuff in the mail, she gets phone calls, people are writing things on her house, using the pseudonym that they used when she was at Tulane and only they would know that name. Claudia Mullen: My real name was never used. Never. Lois L. Norris: Were they all children at the time? Valerie Wolf: Yes. All children. And the thing is, as therapists, we are trying really hard to figure this out and to get as much information as we can. Claudia's memories have been verified ... a lot of them. The way I have approached this is, I don't read in the field. So as people give me information, I send them to experts like Alan Scheflin who has a lot of information, and then he will get back to me to confirm or deny. He has never denied any information that I have sent him. Some of it can't be because we don't have all the information, but a lot of Claudia's memories have been validated, and they are not in any published source. The only way she would know the things she knows is if she had filed for Freedom of Information Act information. This is what Alan Scheflin is telling me. I have been very careful not to know a whole lot, so if someone tells me something, I don't even cue them because I don't know either. Valerie Wolf: Dr. Alan Scheflin, you have his resume in the documentation and a statement from him about Claudia, he has been for the past twenty years filing Freedom of Information Act filings to get this information ... has been piecing it together. Other people across the country have been doing the same, going back to the government files, getting what they can. And what they have also been doing is writing books, sharing information. So he has actual Freedom of Information Act information. The problem is when the requests are going in now, they are being slowed down, or denied, just kind of lost in the shuffle -- and the information is very difficult to get. Dr. Duncan Thomas: I am sorry. I don't see the documentation in the package provided to me. Is there something missing. Valerie Wolf: I sent a packet of documentation overnight mail... it should have been here on Monday, and more yesterday. Hearing Spokesperson:If we haven't received it, we will let you know. Dr. Duncan Thomas: Does any of this documentation specifically refer to radiation experiments? Because we are told by CIA that they never did any radiation experiments. What we need is documentation in order to pursue that. Dr. Duncan Thomas: And that's included in the package you sent Steven Claydman (?). Claudia Mullen: Yes. I gave him project numbers, project names, sub-project numbers... even the subjects ... we were given numbers ourselves for each specific experiment and I overheard my number because they assumed ... they used techniques so you would forget. When you go home, you wouldn't remember what happened. So they just talked freely ... that's why no one ever hid their face, wore a mask or anything because they knew that I would not remember. And I didn't. I did not remember until two years ago. Valerie Wolf: I think you could also follow up on Dr. L. Wilson Greene. I don't know if you have come across him, but he seems to have been involved in both. And I think, realistically in terms of the mind control, some of the subjects were used in mind control and radiation, some as you have been hearing have been strictly radiation, and some were strictly mind control. I think the reason it is coming up now is because in some of the stuff people are remembering, they knew that it would break down. They really worked hard to induce amnesia, and they knew it would break down, and I think in the last couple of years that is what has been happening because we have been hearing more and more and ... so we are just trying to find out what's happening here. So we would appreciate any help you could give us. Chris Ebner: I just wanted to address you (Dr. Duncan Thomas) for a moment... the question you asked about the documentation on radiation specifically ... included in my packet and I don't know if you have that or not. It's entitled "Radiation File Information". There are subject names, experiment names, and some code numbers that I remembered. The problem is that we have no way of verifying that without opening the files.